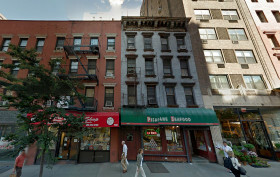 Piscane Seafood, one of the oldest remaining fish markets in the city, closed this spring, and its humble 19th-century home at 940 First Avenue will be replaced by a 14-story residential building. According to permits filed with the city’s Department of Buildings yesterday, the narrow 25-foot-wide lot will give rise to a 141-foot-tall tower developed by Brooklyn-based CS Real Estate Group and designed by the often-maligned architect Karl Fischer. The building will provide a commercial storefront at ground level and thirteen floor-through units above, likely condominiums.